Recently, the cover story of the Lung Cancer Special Issue of Cure Magazine set off a firestorm within the lung cancer community. “Quitting Smoking is Possible,” the cover declared in a large red font, and then the magazine flopped open to a two-page centerfold featuring a hand holding a cigarette, followed by a large chart comparing over half a dozen FDA-approved smoking cessation aids. UGH. I am a lung cancer patient – diagnosed Stage IV at age 41 while working as a fitness instructor and having never smoked or lived with a smoker in my life. This headline ruined my day. For decades, anti-tobacco efforts used negative and threatening images about lung cancer to warn of smoking’s risks. While effective at reducing smoking, this approach caused people to equate smoking with lung cancer. Smokers and lung cancer patients became villains, along with tobacco. This villainization and stigmatizing of the people — the lung cancer stigma — has wrought much damage, leaving lung cancer as the most deadly cancer worldwide, yet one of the least funded, resulting in a survival rate that has barely improved in the last 40 years. 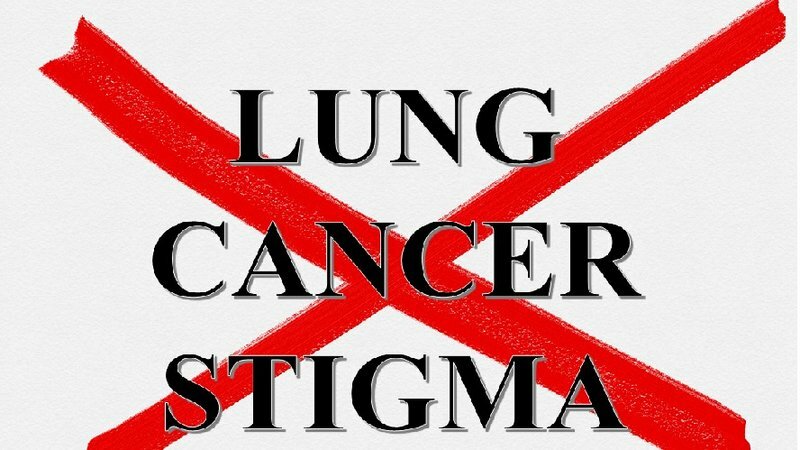 Since my diagnosis, I, along with many others in the lung cancer community, have spent much of our precious time advocating to stop the lung cancer stigma, and still it persists. How did CURE Magazine, the largest consumer publication in the United States focused entirely on cancer, with broad distribution to cancer patients, cancer centers and advocacy groups – in their special Lung Cancer issue, no less – miss the message lung cancer patients have been trying to get across for years now? The “smoking equals lung cancer” trope is unfair and inaccurate. The U.S. surgeon general lists 21 deadly diseases, including 11 cancers, caused by smoking, and the New England Journal of Medicine lists more than a dozen other diseases that also may add to the tobacco death toll (see here). But media and publications (like the CURE Magazine cover story) focus smoking and smoking cessation discussions primarily, and often exclusively, on lung cancer. This reinforces the stigma–and it needs to stop. The public gets the mistaken impression that if they don’t smoke, they’re safe from lung cancer. As a never-smoker, both my doctor and I were shocked when I was diagnosed with advanced lung cancer. I’d been diligent about getting my first mammogram a year prior to my diagnosis. Yet, lung cancer wasn’t even on my (or my doctor’s) radar, despite killing almost twice as many women as breast cancer every year. Lung cancer, the number one cancer killer worldwide, needs to be on everyone’s radar. The vast majority, about 80%, of lung cancer patients today are already never or non-smokers. Telling them they need to quit is offensive and mostly pointless. The public gets the mistaken impression that lung cancer is the only significant risk of smoking. People need to understand the entire universe of risks taken, and what other types of diseases to watch out for, if they choose to smoke. The stigma surrounding lung cancer means that funding for this disease falls far short of other diseases. Inadequate funding results in less research and dismal survival rates. Continued focus on smoking overshadows an alarming trend. The annual increase in the incidence of never-smokers developing lung cancer (attributable to an absolute increase in number, not a change in ratio of never-smokers to current and ex-smokers) has risen precipitously (and so far, inexplicably) in the last decade (see here). The focus on smoking also overshadows the population of younger lung cancer patients, who are more likely to be never-smokers than older patients. In 2014, the year I was diagnosed, roughly 30,000 people under the age of 50 were diagnosed with lung cancer and slightly over 21,000 died from the disease. To put this in perspective, approximately 8,300 women under the age of 54 died from breast cancer that same year (see here). Lung cancer patients experience blame (imposed both internally and externally) for their disease more than other types of patients, resulting in hesitation to seek or receive proper treatment. This is a heartbreaking and unfair burden to lay upon people already suffering from a terrible diagnosis. To be clear, nobody, least of all lung cancer patients, should oppose smoking cessation efforts. Our quibble is with those continuing to highlight smoking in the lung cancer space. So long as media continues to perpetuate the message that lung cancer is “the” smoker’s disease, all of us lose, especially us lung cancer patients. We must de-link the constant anti-smoking messages from lung cancer. The stigma is literally killing us. The era of lung cancer being the poster child for the anti-tobacco and smoking cessation messaging needs to end. We in the lung cancer community are asking CURE Magazine and other media to please help us #StopTheLungCancerStigma. Please, sign our petition HERE.